Flip Out Mama: Mutt Shop Products For All Your Camping And Outdoor Needs! Mutt Shop Products For All Your Camping And Outdoor Needs! My family loves camping and spending time outdoors. We don't get to go camping nearly as much as we would like, since someone is always at work or school or running around somewhere. It is rare that we are all in the same place at the same time! However, I am always trying to build up our supply of camping and outdoor gear so that when the rare time comes that we get the chance to go camping, we will be ready! I was recently searching for some new gear when I came across Mutt Shop Products. Mutt Shop is a really cool site because they have all sorts of outdoor products and gear. I like that they don't specialize in any one particular thing, you can find everything there! They even make some of the products that they sell themselves, how cool is that!? 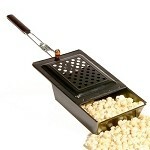 You can make popcorn over a campfire, backyard fire pit, or even over the stove! I love this thing, I have got to get one for our camping gear stash! I remember my parents had a thing like this when I was younger, and I loved it! If you are looking for some cool new gear like this, check out Mutt Shop Products, and they will get you taken care of!